Halley comes from a musical family - her dad ran a record store for decades - and was always around music, so playing music came pretty naturally: She started playing cello at age 9. Interestingly, she wanted to play bass, initially, like her dad. It just so happened that there was a new kid in her class who wanted to play bass also, so Halley gave up the bass to that kid to make her feel a bit more welcome. Consequently, Halley "moved up" one instrument, to the cello, loved it, and stuck with it. Halley Feaster is anything but what one would expect from a “cellist”. Playing both an acoustic cello and a 6-string electric cello, her music ranges from sweet Folk to brutal Metal without compromise. 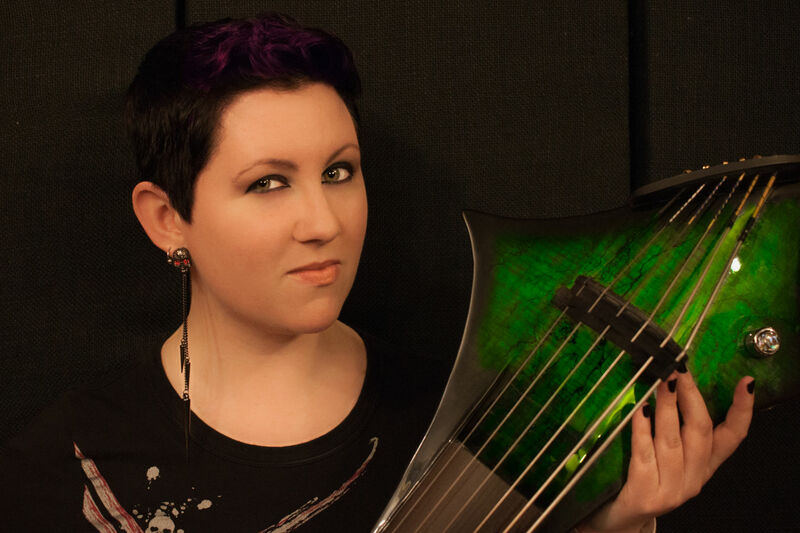 With her first paid gigs at age 13, and already a die-hard Metal Head, Halley attended Berklee College of Music in her pursuit of making Cello Rock her own. Graduating right into the housing market crash of 2008 and the subsequent recession, she decided to make a virtue out of necessity and started creating her own gigs (since there weren't any). What followed was a wild roller coaster ride: She founded a music production company, Rock Solid Productions, while holding various other jobs including positions in real estate and CD-manufacturing. Meanwhile she kept playing cello and bass in cover bands, music history lectures, film scores, pitorchestras and local Symphonies. Always focused on her own music, Halley continued to raise funds and record for “CelloVein: Bad Cellist” for over 7 years. Halley is a passionate advocate for music and the arts. She serves as a committee leader of the Long Beach Island Arts Council and continues working with the Island's Foundation for the Arts and Sciences as well as the New Jersey Library System to bring music and culture to the Jersey Shore. She is also a member of the Philadelphia Chapter of the Recording Academy (Grammy Foundation) and of the American Federation of Musicians. Halley has performed and recorded with a great variety of artists including The Dropkick Murphys, Steve Winwood, Gloria Estefan, Herbie Hancock, Esperanza Spalding, Judith de los Santos, Jon Finn, and many more. CelloVein is less a “band name” and more of a pseudonym for Rock Cellist Halley Feaster. Even since beginning playing the cello at the age of nine, she had no intention of becoming a classical cellist (much to the dismay and confusion of some of her teachers). The music that spoke to her the most directly has always been blues, rock, and metal. Think of Halley as a guitarist trapped in a cellist’s body.What can I expect to hear on Bad Cellist? It’s a cello, so, classical? Or what?Hear the guitar tracks on the album? Yeah… those are cellos. I know they sound like guitars, but they aren’t. Except for segments of Stairway to Heaven, where Jon Finn was kind enough to lay down some sweet 12-string acoustic guitar, the only instruments you’re hearing on this whole album are Cellos (Acoustic and Electric), Electric Bass, Drums and Percussion, Vocals,and a Viola. Bad Cellist features Halley Feaster’s original compositions, in a broad spectrum of genres: Sweet, folky ballads with a twist, like I Can’t Forget and September. Angrier, more aggressive rock with Anger and Isle of Apollo. Psychedelic Blues/Rock in Bleus, and straight up Metal with Flight and Wicked. Covers White Rabbit (Jefferson Airplane) and Stairway to Heaven (Ledzeppelin) make the icing on the cake.